2. George DABSON, born 12 June 1854 in Bonnington (Kent), baptized 26 Jun 1854 in Bonnington (Kent), census 1861 in Cottage, Bilsington (Kent), census 1871 at Finn Farm Cottages, Kingsnorth (Kent), census 1881 in Loughton, Ash (Kent), census 1891 in Garston, Ash (Kent), census 1901 at Warehourne Cottages, Ash (Kent), died 8 Apr 1930 in Westmarsh (Kent) - Aged 75, occupation 1871 - 1891 Agricultural Labourer, occupation 1901 Waggoner on Farm. He married (1) Mary Elizabeth KEMP, 17 Oct 1874 at St Andrew, Wickhambreaux (Kent), born Abt 1850 in Tilmanstone (Kent), baptized 6 Feb 1853 at St Andrew, Tilmanstone (Kent), census 1881 in Loughton, Ash (Kent), census 1891 in Garston, Ash (Kent), died 30 Apr 1891 in Ash (Kent) - Aged 41. He married (2) Mary Elizabeth STACE, 17 Oct 1903 at Holy Trinity, Westmarsh (Kent), resided at Rose Cottage, Westmarsh (Kent). i Ada Elizabeth DABSON, born 1878 in Worth (Kent), baptized 7 Apr 1878 at Ss Peter & Paul, Worth (Kent), census 1881 in Loughton, Ash (Kent), census 1901 at Warehourne Cottages, Ash (Kent), died 7 July 1945 at 25 East Street, Dover (Kent). She married Henry George SMITH, 26 Apr 1899 at St Nicholas, Ash (Kent), born Abt 1880 in Sandwich (Kent), baptized 7 Mar 1880 at St Clement, Sandwich (Kent), census 1901 at Warehourne Cottages, Ash (Kent), died 10 Sep 1957 at 29 East Street, Dover (Kent), occupation 1901 Journeyman Baker. ii Annie Jane (Nance) DABSON, born Dec 1879 in Ash (Kent), census 1881 in Loughton, Ash (Kent), census 1891 in Garston, Ash (Kent). She married Herbert MIDDLETON, 4 Nov 1899 at Holy Trinity, Westmarsh (Kent). iii Alice Mary DABSON, born Abt 1882 in Ash (Kent), census 1891 in Garston, Ash (Kent). She married Frederick William CLARKE, 6 Nov 1915 at Holy Trinity, Westmarsh (Kent). iv Ellen Sarah DABSON, born Sep 1884 in Ash (Kent), census 1891 in Garston, Ash (Kent), census 1901 at Warehourne Cottages, Ash (Kent). vi Sarah Jane DABSON, born Abt 1889 in Ash (Kent), census 1891 in Garston, Ash (Kent), died 9 May 1895 in Ash (Kent). vii Walter George DABSON, born Sep 1889 in Ash (Kent), census 1891 in Garston, Ash (Kent), census 1901 at Warehourne Cottages, Ash (Kent). 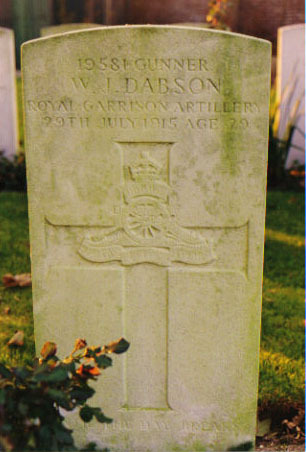 viii John DABSON, born 10 Apr 1891 in Ash (Kent), died 10 Apr 1891 in Ash (Kent) - Lived for 11 Hours. 3. Mary Elizabeth KEMP, born Abt 1850 in Tilmanstone (Kent), baptized 6 Feb 1853 at St Andrew, Tilmanstone (Kent), census 1881 in Loughton, Ash (Kent), census 1891 in Garston, Ash (Kent), died 30 Apr 1891 in Ash (Kent) - Aged 41. 4. William DABSON, also known as William DAPSON, born Abt 1830 in Pluckley (Kent), baptized 21 Feb 1830 at St Nicholas, Pluckley (Kent), census 1851 in Bilsington (Kent), died 1860 Aged 30, occupation 1851 Farm Labourer. He married Jane NOAKES, 5 Mar 1854 at Ss Peter & Paul, Bilsington (Kent). 2. i George DABSON, born 12 June 1854 in Bonnington (Kent), baptized 26 Jun 1854 at St Rumwold, Bonnington (Kent), census 1861 in Cottage, Bilsington (Kent), census 1871 at Finn Farm Cottages, Kingsnorth (Kent), census 1881 in Loughton, Ash (Kent), census 1891 in Garston, Ash (Kent), census 1901 at Warehourne Cottages, Ash (Kent), died 8 Apr 1930 in Westmarsh (Kent) - Aged 75, occupation 1871 - 1891 Agricultural Labourer, occupation 1901 Waggoner on Farm. He married (1) Mary Elizabeth KEMP, 17 Oct 1874 at St Andrew, Wickhambreaux (Kent), born Abt 1850 in Tilmanstone (Kent), baptized 6 Feb 1853 at St Andrew, Tilmanstone (Kent), census 1881 in Loughton, Ash (Kent), census 1891 in Garston, Ash (Kent), died 30 Apr 1891 in Ash (Kent) - Aged 41. He married (2) Mary Elizabeth STACE, 17 Oct 1903 at Holy Trinity, Westmarsh (Kent), resided at Rose Cottage, Westmarsh (Kent). ii James DABSON, born Abt 1857 in Bonnington (Kent), census 1861 in Cottage, Bilsington (Kent), census 1871 at Bridge Farm, Bilsington (Kent). iii Ann DABSON baptised 13 Nov 1859 at St Rumwold, Bonnington (Kent), buried 29 Apr 1860 at St Rumwold, Bonnington (Kent), aged 5 months. 5. Jane NOAKES, born Abt 1832 in Ruckinge (Kent), baptized 28 Apr 1833 at St Mary Magdalene, Ruckinge (Kent), census 1841 in Ruckinge (Kent), census 1851 in Aldington (Kent), census 1861 in Cottage, Bilsington (Kent), census 1871 at Bridge Farm, Bilsington (Kent), census 1881 at Langden Cottage, Ruckinge (Kent), census 1891 at Way Street, Ruckinge (Kent), died Mar 1901 in Bridge RD (Kent). She married (1) William DABSON, also known as William DAPSON, 5 Mar 1854 at Ss Peter & Paul, Bilsington (Kent), born Abt 1830 in Pluckley (Kent), baptized 21 Feb 1830 at St Nicholas, Pluckley (Kent), census 1851 in Bilsington (Kent), occupation 1851 Farm Labourer, died 1860 Aged 30. She married (2) Henry BOULTON, 3 Sep 1862 at East Ashford Register Office (Kent), born Abt 1831 in Cheshunt (Herts), census 1861 in Bilsington (Kent), census 1871 at Bridge Farm, Bilsington (Kent), census 1881 at Langden Cottage, Ruckinge (Kent), census 1891 at Way Street, Ruckinge (Kent), census 1901 at Forge Cottage, Ruckinge (Kent), occupation 1871 - 1901 Agricultural Labourer. i Sarah NOAKES, born Abt 1850 in Ruckinge (Kent), census 1851 in Aldington (Kent), census 1861 in Cottage, Bilsington (Kent). 2. ii George DABSON, born 12 June 1854 in Bonnington (Kent), baptized 26 Jun 1854 at St Rumwold, Bonnington (Kent), census 1861 in Cottage, Bilsington (Kent), census 1871 at Finn Farm Cottages, Kingsnorth (Kent), census 1881 in Loughton, Ash (Kent), census 1891 in Garston, Ash (Kent), census 1901 at Warehourne Cottages, Ash (Kent), died 8 Apr 1930 in Westmarsh (Kent) - Aged 75, occupation 1871 - 1891 Agricultural Labourer, occupation 1901 Waggoner on Farm. He married (1) Mary Elizabeth KEMP, 17 Oct 1874 at St Andrew, Wickhambreaux (Kent), born Abt 1850 in Tilmanstone (Kent), baptized 6 Feb 1853 at St Andrew, Tilmanstone (Kent), census 1881 in Loughton, Ash (Kent), census 1891 in Garston, Ash (Kent), died 30 Apr 1891 in Ash (Kent) - Aged 41. He married (2) Mary Elizabeth STACE, 17 Oct 1903 at Holy Trinity, Westmarsh (Kent), resided at Rose Cottage, Westmarsh (Kent). iii James DABSON, born Abt 1857 in Bonnington (Kent), census 1861 in Cottage, Bilsington (Kent), census 1871 at Bridge Farm, Bilsington (Kent). iv Ann DABSON baptised 13 Nov 1859 at St Rumwold, Bonnington (Kent), buried 29 Apr 1860 at St Rumwold, Bonnington (Kent), aged 5 months. 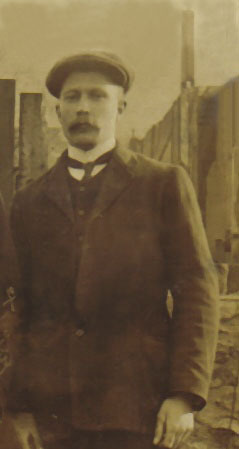 v William Henry BOULTON, born Dec 1862 in Bilsington (Kent), census 1871 at Bridge Farm, Bilsington (Kent). vi Hannah (Annie) BOULTON, born Jun 1865 in Aldington (Kent), census 1871 at Bridge Farm, Bilsington (Kent). vii Mary Elizabeth BOULTON, born Mar 1868 in Aldington (Kent), census 1871 at Bridge Farm, Bilsington (Kent), census 1881 at Langden Cottage, Ruckinge (Kent). viii Robert Thomas BOULTON, born 31 Mar 1871 in Bilsington (Kent), census 1871 at Bridge Farm, Bilsington (Kent), census 1881 at Langden Cottage, Ruckinge (Kent), died Sep 1887 Aged 16.
ix Charles Jesse BOULTON, born Sep 1875 in Bilsington (Kent), census 1881 at Langden Cottage, Ruckinge (Kent), census 1891 at Way Street, Ruckinge (Kent), occupation 1891 Agricultural Labourer. 8. Jeremiah DABSON, also known as Jeremiah DAPSON, born 1804 in Orlestone (Kent), baptized 4 Nov 1804 at St Mary, Orlestone (Kent), died 1832 Aged 28, buried 30 Sep 1832 at Ss Peter & Paul, Bilsington (Kent). He married Harriett SKEER, 15 May 1830 at St Michael, Smarden (Kent). 4. i William DABSON, also known as William DAPSON, born Abt 1830 in Pluckley (Kent), baptized 21 Feb 1830 at St Nicholas, Pluckley (Kent), census 1851 in Bilsington (Kent), died 1860 Aged 30, occupation 1851 Farm Labourer. He married Jane NOAKES, 5 Mar 1854 at Ss Peter & Paul, Bilsington (Kent). 9. Harriett SKEER, born Abt 1808 in Pluckley (Kent), baptized 5 May 1808 at St Nicholas, Pluckley (Kent), census 1851 in Bilsington (Kent), census 1861 at Priory Cottage, Bilsington (Kent), died 1868 in Bilsington (Kent), buried 25 Mar 1868 at Ss Peter & Paul, Bilsington (Kent). She married (1) Jeremiah DABSON, also known as Jeremiah DAPSON, 15 May 1830 at St Michael, Smarden (Kent), born 1804 in Orlestone (Kent), baptized 4 Nov 1804 at St Mary, Orlestone (Kent), died 1832 Aged 28, buried 30 Sep 1832 at Ss Peter & Paul, Bilsington (Kent). She married (2) Richard Turell HARRIS, 9 May 1835 in Ss Peter & Paul, Bilsington (Kent), born 1811 in Burmarsh (Kent), baptized 17 Mar 1811 in Burmarsh (Kent), census 1851 in Bilsington (Kent), census 1861 at Priory Cottage, Bilsington (Kent), died Dec 1865 in Bilsington (Kent), buried 20 Dec 1865 at Ss Peter & Paul, Bilsington (Kent), occupation 1851 - 1861 Agricultural Labourer. i Sarah SKEER, born 1825 in Pluckley (Kent), baptized 18 Dec 1825 at St Nicholas, Pluckley (Kent). 4. ii William DABSON, also known as William DAPSON, born Abt 1830 in Pluckley (Kent), baptized 21 Feb 1830 at St Nicholas, Pluckley (Kent), census 1851 in Bilsington (Kent), died 1860 Aged 30, occupation 1851 Farm Labourer. He married Jane NOAKES, 5 Mar 1854 at Ss Peter & Paul, Bilsington (Kent). iii John HARRIS, born 1836 in Bilsington (Kent), baptized 9 Jan 1836 at Ss Peter & Paul, Bilsington (Kent), census 1851 in Bilsington (Kent), occupation 1851 Farm Labourer. iv Samuel HARRIS, born 1837 in Bilsington (Kent), baptized 13 Aug 1837 at Ss Peter & Paul, Bilsington (Kent), died 1838 in Bilsington (Kent), buried 19 Jun 1838 at Ss Peter & Paul, Bilsington (Kent). v Harriet HARRIS, born 1842 in Bonnington (Kent), census 1851 in Bilsington (Kent). vi Henry HARRIS, born 1843 in Bonnington (Kent), census 1851 in Bilsington (Kent), census 1861 at Priory Cottage, Bilsington (Kent), occupation 1861 Agricultural Labourer. vii Fanny HARRIS, born Dec 1845 in Bilsington (Kent), baptized 7 Dec 1845 at Ss Peter & Paul, Bilsington (Kent), census 1851 in Bilsington (Kent). viii Mary Ann HARRIS, born 28 Jun 1847 in Bilsington (Kent), baptized 29 Aug 1847 at Ss Peter & Paul, Bilsington (Kent), census 1851 in Bilsington (Kent), census 1861 at Priory Cottage, Bilsington (Kent), census 1871 in Brabourne Lees (Kent), died 1 Jul 1885 in Smeeth (Kent), buried 1885 at St Mary, Smeeth (Kent). She married Thomas VILE, 20 Jun 1868 at St Mary, Smeeth (Kent). ix James HARRIS, born 1850 in Bilsington (Kent), baptized 17 Feb 1850 in Bilsington (Kent), census 1851 in Bilsington (Kent), census 1861 at Priory Cottage, Bilsington (Kent), census 1871 at Camber Point, Aldington (Kent), census 1881 at Priory Road, Bilsington (Kent), census 1891 at Frith Road, Bilsington (Kent), census 1901 at The Frith, Aldington (Kent), occupation 1871 - 1901 Agricultural Labourer. x Charles HARRIS, born Jun 1852 in Bilsington (Kent), baptized 25 Jul 1852 in Bilsington (Kent), census 1861 in Priory Cottage, Bilsington (Kent). 10. Henry NOAKES, born Abt 1802 in Ruckinge (Kent), baptized 28 Jan 1803 at St Mary Magdalene, Ruckinge (Kent), census 1851 Lodger - Blue Anchor Inn, Ruckinge (Kent), census 1861 Lodger - Cross Inn, Bilsington (Kent), census 1871 Lodger - Blue Anchor Inn, Ruckinge (Kent), occupation 1851 - 1871 Agricultural Labourer, died 1878 in Ruckinge (Kent) - Aged 77, buried 13 Jul 1878 at St Mary Magdalene, Ruckinge (Kent). He married Mary DIAMOND, 13 Jun 1830 at St Mary Magdalene, Ruckinge (Kent). 5. i Jane NOAKES, born Abt 1832 in Ruckinge (Kent), baptized 28 Apr 1833 at St Mary Magdalene, Ruckinge (Kent), census 1841 in Ruckinge (Kent), census 1851 in Aldington (Kent), census 1861 in Cottage, Bilsington (Kent), census 1871 at Bridge Farm, Bilsington (Kent), census 1881 at Langden Cottage, Ruckinge (Kent), census 1891 at Way Street, Ruckinge (Kent), died Mar 1901 in Bridge RD (Kent). She married (1) William DABSON, also known as William DAPSON, 5 Mar 1854 at Ss Peter & Paul, Bilsington (Kent), born Abt 1830 in Pluckley (Kent), baptized 21 Feb 1830 at St Nicholas, Pluckley (Kent), census 1851 in Bilsington (Kent), occupation 1851 Farm Labourer, died 1860 Aged 30. She married (2) Henry BOULTON, 3 Sep 1862 at East Ashford Register Office (Kent), born Abt 1831 in Cheshunt (Herts), census 1861 in Bilsington (Kent), census 1871 at Bridge Farm, Bilsington (Kent), census 1881 at Langden Cottage, Ruckinge (Kent), census 1891 at Way Street, Ruckinge (Kent), census 1901 at Forge Cottage, Ruckinge (Kent), occupation 1871 - 1901 Agricultural Labourer. ii Elizabeth NOAKES, born Abt 1835 in Ruckinge (Kent), baptized 11 Jan 1835 at St Mary Magdalene, Ruckinge (Kent), census 1841 in Ruckinge (Kent). 11. Mary DIAMOND, born Abt 1802, died 1837 Aged 35, buried 28 Jul 1837 at St Mary Magdalene, Ruckinge (Kent). 16. Thomas DABSON, also known as Thomas DAPSON, born Abt 1777 in Smarden (Kent), baptized 25 May 1777 at St Michael, Smarden (Kent), census 1841 in Warehorne (Kent), census 1851 at Hatch Farm, Warehorne (Kent), occupation 1841 - 1851 Agricultural Labourer, died Aug 1854 in Warehorne (Kent) - Age given as 78, buried 13 Aug 1854 at St Matthew, Warehorne (Kent). He married Elizabeth LANGFORD, 19 Jun 1796 at St Matthew, Warehorne (Kent). i Elizabeth DABSON, born 1798, baptized 27 May 1798 at St Mary, Orlestone (Kent). ii Thomas DABSON, also known as Thomas DAPSON, born 1800, baptized 29 Jun 1800 at St Mary, Orlestone (Kent), died Jun 1808 in Warehorne (Kent), buried 23 Jun 1808 at St Matthew, Warehorne (Kent). 8. iii Jeremiah DABSON, also known as Jeremiah DAPSON, born 1804 in Orlestone (Kent), baptized 4 Nov 1804 at St Mary, Orlestone (Kent), died 1832 Aged 28, buried 30 Sep 1832 at Ss Peter & Paul, Bilsington (Kent). He married Harriett SKEER, 15 May 1830 in Smarden (Kent). iv James DABSON, born 1806, baptized 30 Nov 1806 at St Mary, Orlestone (Kent). v Mary DABSON, also known as Mary DAPSON, born 1809, baptized 3 Jul 1809 at St Mary, Orlestone (Kent). She married Thomas HESELDEN, 9 Apr 1837 at St Matthew, Warehorne (Kent). vi Sarah DABSON, born 1811, baptized 26 May 1811 at All Saints, Woodchurch (Kent). vii Thomas DABSON, also known as Thomas DAPSON, born 1812, baptized 26 Jul 1812 at All Saints, Woodchurch (Kent), census 1851 at Harts Farm, Lydd (Kent), census 1861 "Head Absent" - Harts Farmhouse, Dengemarsh, Lydd (Kent), census 1871 at Tinton Farm, Warehorne (Kent), resided 1875 at Tinton Farm, Warehorne (Kent), occupation 1844 Waggoner, occupation 1851 Farmer, occupation 1861 Farmer of 40 acres, occupation 1871 Farmer of 175 acres, employing 5 men, died 7 Feb 1875 Age given as 61, buried 12 Feb 1875 at St Matthew, Warehorne (Kent). He married Eliza BROWN, 26 Jun 1843 at Ss Peter & Paul, Appledore (Kent). viii George DABSON, born 1814, baptized 24 Apr 1814 at All Saints, Woodchurch (Kent), died Feb 1821 in Warehorne (Kent) - Aged 7, buried 15 Feb 1821 at St Matthew, Warehorne (Kent). ix David DABSON, born 1816 in Woodchurch (Kent), baptized 5 May 1816 at All Saints, Woodchurch (Kent), census 1841 in Warehorne (Kent), census 1851 at Hatch Farm, Warehorne (Kent), occupation 1841 - 1851 Agricultural Labourer, died Sep 1873 Age given as 54, buried 17 Sep 1873 at St Matthew, Warehorne (Kent). x Anne DABSON, also known as Anne DAPSON, born 1818 in Warehorne (Kent), baptized 7 Jun 1818 at St Matthew, Warehorne (Kent), census 1841 in Warehorne (Kent), census 1851 in Ivychurch (Kent). She married John TANTON, 30 Nov 1844 at St Matthew, Warehorne (Kent). xi George DABSON, also known as George DAPSON, born 1823 in Warehorne (Kent), baptized 21 Apr 1823 at St Matthew, Warehorne (Kent), census 1851 in Ivychurch (Kent), occupation 1851 Agricultural Labourer, died Mar 1866 in Ivychurch (Kent). He married Mary Ann LEPPER, 2 Mar 1850 at All Saints, Lydd (Kent). 17. Elizabeth LANGFORD, born Abt 1776 in Warehorne (Kent), baptized 23 Mar 1777 at St Matthew, Warehorne (Kent), census 1841 in Warehorne (Kent), census 1851 at Hatch Farm, Warehorne (Kent), died Sep 1856 in Warehorne (Kent) - Age given as 81, buried 7 Sep 1856 at St Matthew, Warehorne (Kent). 18. John SKEER, born 1768, baptized 17 Jan 1768 at St Nicholas, Pluckley (Kent). He married Jane [maiden name unknown – marriage not found]. 9. i Harriett SKEER, born Abt 1808 in Pluckley (Kent), baptized 5 May 1808 at St Nicholas, Pluckley (Kent), census 1851 in Bilsington (Kent), census 1861 at Priory Cottage, Bilsington (Kent), died 1868 in Bilsington (Kent), buried 25 Mar 1868 at Ss Peter & Paul, Bilsington (Kent). She married (1) Jeremiah DABSON, also known as Jeremiah DAPSON, 15 May 1830 in Smarden (Kent), born 1804 in Orlestone (Kent), baptized 4 Nov 1804 at St Mary, Orlestone (Kent), died 1832 Aged 28, buried 30 Sep 1832 at Ss Peter & Paul, Bilsington (Kent). She married (2) Richard Turell HARRIS, 9 May 1835 in Ss Peter & Paul, Bilsington (Kent), born 1811 in Burmarsh (Kent), baptized 17 Mar 1811 in Burmarsh (Kent), census 1851 in Bilsington (Kent), census 1861 at Priory Cottage, Bilsington (Kent), occupation 1851 - 1861 Agricultural Labourer, died Dec 1865 in Bilsington (Kent), buried 20 Dec 1865 at Ss Peter & Paul, Bilsington (Kent). 19. Jane [maiden name unknown – marriage not found]. 20. John NOAKES, born Abt 1755, (possibly in Lydd, Kent), died 1826 in Ruckinge (Kent) - Aged 71, buried 17 Sep 1826 at St Mary Magdalene, Ruckinge (Kent). He married Elizabeth COLLINS, 8 Jan 1782 at St Mary Magdalene, Ruckinge (Kent). i John NOAKES, born Abt 1781 in Ruckinge (Kent), baptized 18 Jan 1782 at St Mary Magdalene, Ruckinge (Kent). He married Lydia BUTTERWORTH, 21 Jul 1821 at St Eanswith, Brenzett (Kent). ii Rebecca NOAKES, born Abt 1787 in Ruckinge (Kent), baptized 13 Nov 1787 at St Mary Magdalene, Ruckinge (Kent), died 1856 in Whitstable (Kent). She married Benjamin BEDO, 28 Jul 1828 at St Mary Magdalene, Ruckinge (Kent). iv Mary NOAKES, born Abt 1794 in Ruckinge (Kent), baptized 30 Mar 1794 at St Mary Magdalene, Ruckinge (Kent). v Thomas NOAKES, born Abt 1799 in Ruckinge (Kent), baptized 17 Mar 1799 at St Mary Magdalene, Ruckinge (Kent), died Nov 1883 in East Ashford Workhouse, Willesborough (Kent), buried 22 Nov 1883 at St Mary Magdalene, Ruckinge (Kent). He married Sarah CHAPMAN, 26 Feb 1825 at St Mary Magdalene, Ruckinge (Kent). 10. vi Henry NOAKES, born Abt 1802 in Ruckinge (Kent), baptized 28 Jan 1803 at St Mary Magdalene, Ruckinge (Kent), census 1851 Lodger - Blue Anchor Inn, Ruckinge (Kent), census 1861 Lodger - Cross Inn, Bilsington (Kent), census 1871 Lodger - Blue Anchor Inn, Ruckinge (Kent), occupation 1851 - 1871 Agricultural Labourer, died 1878 in Ruckinge (Kent) - Aged 77, buried 13 Jul 1878 at St Mary Magdalene, Ruckinge (Kent). He married Mary DIAMOND, 13 Jun 1830 at St Mary Magdalene, Ruckinge (Kent). 32. Jeremiah DABSON, also known as Jeremiah DAPSON, born 1748 in Smarden (Kent), baptized 17 Jul 1748 at St Michael, Smarden (Kent), died 1781 in Smarden (Kent), buried 5 Oct 1781 at St Michael, Smarden (Kent). He married Sarah KENNARD, 19 May 1772 at St Mildred, Tenterden (Kent). i Jeremiah DABSON, also known as Jeremiah DAPSON, born Abt 1775 in Smarden (Kent), baptized 30 Jul 1775 at St Michael, Smarden (Kent), census 1851 at Beggars Bridge, Smarden (Kent), occupation 1851 Pauper (Ag Lab), died Sep 1852 in Smarden (Kent), buried 26 Sep 1852 at St Michael, Smarden (Kent). He married (1) Mary JUDGE, 24 Jul 1797 at St Michael, Smarden (Kent), born Abt 1771 in Smarden (Kent), died 1806, buried 5 May 1806 at St Michael, Smarden (Kent). He married (2) Sarah SHARP, 10 Jul 1807 at St Michael, Smarden (Kent), born Abt 1781 in Egerton (Kent), census 1851 at Beggars Bridge, Smarden (Kent), died Jun 1858 in West Ashford RD (Kent). 16. ii Thomas DABSON, also known as Thomas DAPSON, born Abt 1777 in Smarden (Kent), baptized 25 May 1777 at St Michael, Smarden (Kent), census 1841 in Warehorne (Kent), census 1851 at Hatch Farm, Warehorne (Kent), occupation 1841 - 1851 Agricultural Labourer, died Aug 1854 in Warehorne (Kent) - Age given as 78, buried 13 Aug 1854 at St Matthew, Warehorne (Kent). He married Elizabeth LANGFORD, 19 Jun 1796 at St Matthew, Warehorne (Kent). iii Nicholas DABSON, also known as Nicholas DAPSON, born Abt 1779 in Smarden (Kent), baptized 22 Jun 1779 at St Michael, Smarden (Kent), military 1811 Private - 37th Regiment of Foot, census 1841 at St Michael Street, Dumfries, Scotland, occupation Agricultural Labourer. He married Margaret HALLIDAY, 20 Jul 1798 in Dumfries, Scotland. iv Edmund DABSON, also known as Edmund DAPSON, born Abt 1781 in Smarden (Kent), baptized 11 Mar 1781 at St Michael, Smarden (Kent), died 1804 in Smarden (Kent), buried 11 Nov 1804 at St Michael, Smarden (Kent). 33. Sarah KENNARD, died 1784 in Smarden (Kent), buried 6 Jan 1784 at St Michael, Smarden (Kent). 34. John LANGFORD. He married Elizabeth GOULD, 23 Nov 1769 at St Michael & All Angels, Kingsnorth (Kent). 17. i Elizabeth LANGFORD, born Abt 1776 in Warehorne (Kent), baptized 23 Mar 1777 at St Matthew, Warehorne (Kent), census 1841 in Warehorne (Kent), census 1851 at Hatch Farm, Warehorne (Kent), died Sep 1856 in Warehorne (Kent) - Age given as 81, buried 7 Sep 1856 at St Matthew, Warehorne (Kent). She married Thomas DABSON, also known as Thomas DAPSON, 19 Jun 1796 at St Matthew, Warehorne (Kent). 36. John SKEER. He married Catherine ROBBINS, 16 Oct 1766 at St Margaret, Bethersden (Kent). 18 i John SKEER, born 1768, baptized 17 Jan 1768 at St Nicholas, Pluckley (Kent). He married Jane [maiden name unknown – marriage not found]. ii Sarah SKEER, born 1770, baptized 27 May 1770 at St Nicholas, Pluckley (Kent). iii Winnifred SKEER, born 1775, baptized 28 May 1775 at St Nicholas, Pluckley (Kent). iv Samuel SKEER, born 1779, baptized 21 Mar 1779 at St Nicholas, Pluckley (Kent). v Philip SKEER, born 1781, baptized 21 May 1781 at St Nicholas, Pluckley (Kent). vi Lydia SKEER, born 1783, baptized 26 Jan 1783 at St Nicholas, Pluckley (Kent). vii Margaret SKEER, born 1785, baptized 19 May 1785 at St Nicholas, Pluckley (Kent). She married John HOLMES, 9 Oct 1816 at St Mary, Little Chart (Kent). 64. Jeremiah DABSON, also known as Jeremiah DAPSON, born 1716 in Smarden (Kent), baptized 28 Jul 1716 at St Michael, Smarden (Kent). He married Anne GILBERT, 14 Apr 1748 at St Michael, Smarden (Kent). 32. i Jeremiah DABSON, also known as Jeremiah DAPSON, born 1748 in Smarden (Kent), baptized 17 Jul 1748 at St Michael, Smarden (Kent), died 1781 in Smarden (Kent), buried 5 Oct 1781 at St Michael, Smarden (Kent). He married Sarah KENNARD, 19 May 1772 at St Mildred, Tenterden (Kent). ii Anne DABSON, also known as Anne DAPSON, born 1750 in Smarden (Kent), baptized 5 Aug 1750 at St Michael, Smarden (Kent). iii Elizabeth DABSON, also known as Elizabeth DAPSON, born 1752 in Smarden (Kent), baptized 22 Mar 1751/52 at St Michael, Smarden (Kent). iv John DABSON, also known as John DAPSON, born 1753 in Smarden or Biddenden (Kent), baptized 6 Jan 1754 at St Michael, Smarden (Kent), Settlement certificate 5 Aug 1786 from Smarden to Frittenden, census 1841 at Raymore Cottages, Frittenden (Kent), occupation 1841 Independent, died 1843 in Frittenden (Kent). He married Obedience BATT, also known as "Beechen", 27 Feb 1786 at St Michael, Smarden (Kent). 65. Anne GILBERT, born Abt 1726, died 1809 in Smarden (Kent) - Aged 83, buried 25 Apr 1809 at St Michael, Smarden (Kent). 128.Jeremiah DABSON, also known as Jeremiah DAPSON. He married Elizabeth BRITCHER, 28 Dec 1714 at St Michael, Smarden (Kent). i George DABSON, also known as George DAPSON, born Abt 1715 in Smarden (Kent), baptized 27 Mar 1716 at St Michael, Smarden (Kent). iii Mary DABSON, also known as Mary DAPSON, born 1720 in Smarden (Kent), baptized 7 Aug 1720 at St Michael, Smarden (Kent). She married Richard PIKE, 8 Oct 1741 at St Michael, Smarden (Kent). iv Robert DABSON, also known as Robert DAPSON, born 1723 in Smarden (Kent), baptized 30 Jun 1723 at St Michael, Smarden (Kent). 129.Elizabeth BRITCHER, died 1735, buried 20 Dec 1735 at St Michael, Smarden (Kent). My thanks to Joyce Banks for information from her personal research, and to Maggie Stewart for the photographs. Thanks also to Sarah Russell for extra information about the NOAKES family.